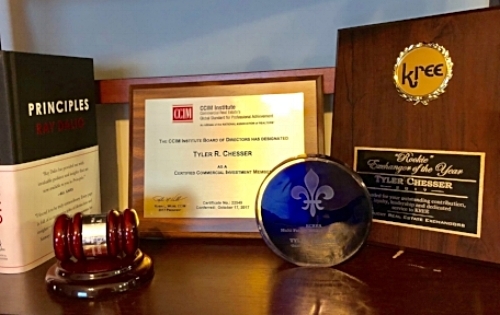 Over the past few weeks I have been blessed to receive a few humbling awards for contributions in the commercial real estate brokerage industry. These moments have been beautiful, shiny, clean, tremendously appreciated and quite frankly, unexpected. The plaque for achieving the CCIM designation, "Rookie" Kentucky Real Estate Exchangor of the Year for 2017, and Kentucky Commercial Real Estate Alliance Multi-Family Broker of the Year for 2017 are now nicely displayed on my bookshelf. The beauty of these recognitions caused me to remember that the process has been anything but beautiful. I have to admit it's been really ugly getting to this point and it continues to be ugly on a daily basis. My commitments, ever-growing responsibilities, daily tasks, packed schedule and the overall work-in-progress nature of my business seem unsightly to me. Being in year five of this business, it's been a hell of an up hill battle. The many hats worn by a commercial real estate broker (that's also an aspiring real estate investor) are sometimes seemingly insurmountable. Each transaction has a tremendous amount of minutia to work through, with a laundry list of impacted parties and challenges around every corner. It is not rare to overcome a long list of challenges yet to meet a ultimatum that critically kills the deal in the 11th hour. Remembering that no deal is better than a bad deal in those circumstances is hard, to say the least. At the same time, we're contending in a very competitive space where deals are extremely timely and pressure filled. Additionally, there is a business to keep organized, with many personalities involved from top to bottom. All the while, we are challenged to remain focused on goals, open minded to set new ones along with action plans and accept or reject certain opportunities that may or may not fit our objectives. Not to mention the requirements to be experts in local market knowledge and somewhat practicing economists with a focus on how global markets impact every move. I have a friend writing a book on the challenges, dreams and prayers of a commercial real estate broker. I will leave it to him to describe in eloquent detail all of the simultaneous stresses of our business. During times of challenge, when it seems nothing is going right, I find myself working overtime swimming upstream to get back to a point of momentum. I have found that momentum is tremendously important in this business - I am not sure if it is due to the fact that your energy is transferred or felt or if you simply just operate better from a mindset of winning. Now that I have momentum on my side, I refuse to give it up. I will continue to sludge through the ugliness of this daily practice to make sure it is beautiful for my clients, partners, prospects, friends and family. The sacrifices are worth it and I am eternally grateful for the opportunities this beautiful business has created for me. I am proud of the person I am becoming from the mold of these pressures because it gives me an opportunity to provide opportunities for others. As long as we stay committed to doing the dirty work, the people that need us will continue to have beautiful results, which is unique to everyone who involved. My purpose remains to provide those opportunities, and I will relentlessly chase them with a persistent and resilient approach. So, I'll be up again tomorrow morning starting at 5am, rinsing and repeating with this purpose top of mind. Wishing you and your family a Merry Christmas, Happy Hanukkah, Happy Holidays and a Happy 2018!